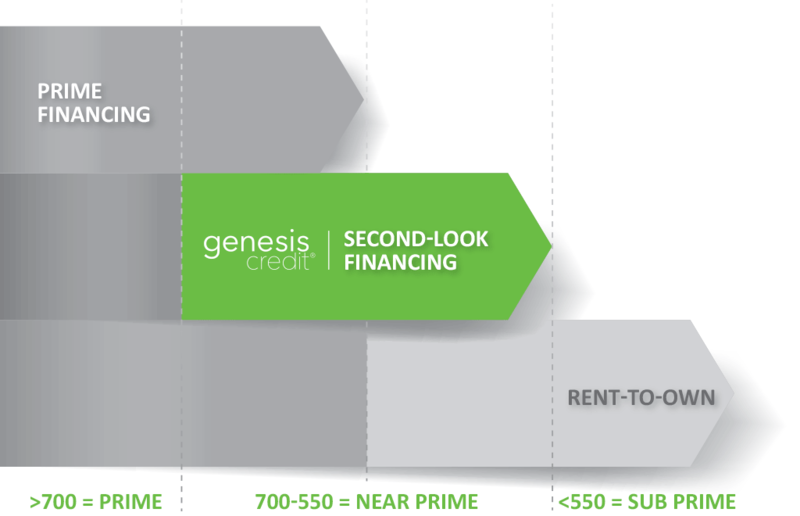 Second-look financing refers to a financial product that is offered to consumers who have been turned down by prime banks for financing, but are really just below the threshold served by primary finance providers. Untapped market for merchants The near-prime market is sizable, it is estimated 30% of the U.S. population falls in this category and a substantial portion of these consumers have solid, full time, income. In an analysis of U.S. banking, the FDIC found that 21% of consumers from households with incomes between $50,000 and $75,000 lack access to traditional financing. Empowering second-look consumers Research indicates 85% of customers, on average, reuse credit at the same location when approved for private label financing. * These consumers will continually seek out retailers that work with them, driving increased satisfaction, and 50% potential increase in repeat purchase rates. ** With quality second-look financing programs, merchants increase sales, improve market share, and build customer loyalty. In the end, all consumers are equal and would like the freedom to purchase goods and services while also building their credit.